In the course of my learning-how-to-cook experience I came up with this most versatile tomato sauce that can be used as a base for many dishes: either thinned out and spiced up for a delicious tomato soup, combined with curry and chicken or vegetables for a quick curry, pureed as tomato sauce for my kids' pasta. The list is endless. 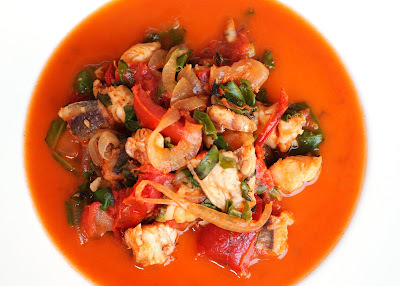 This fish stew is another way of using it: make the tomato base, throw in some fish stock, cubed fish fillets and some green leafy vegetables and you have a really nice meal in no time. Heat the oil in a pan. Cut the onions into fine rings and fry them until soft, about 5 minutes. Add crushed garlic. Cut the tomatoes into bite sizes and add to pan. Add tomato paste, fish stock and white wine and bring to boil. Simmer on low heat for about 15-20 minutes. Add the fish cubes and cook for about 5 minutes, Stir in spinach and cook until wilted. Season with a few drops of tabasco sauce to taste.